89 other birds have this item in their bag or wishlist! Boom Shankar's latest collection has landed in the nest - and it does not disappoint! The Wildflower Skirt is a showcase piece, which you will want to show off time and time again. 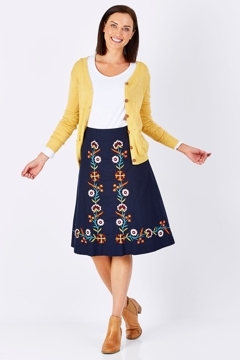 This is a beautiful skirt - the embroidery is stunning and the variety of colours means it will go with so many things. Unfortunately, the fit is quite boxy around my waist, and the next size down will not fit around my hips, so I've decided (regretfully) to return the skirt. I would recommend this for someone who doesn't have much of a waist. This skirt fits well, and is a little larger on size.